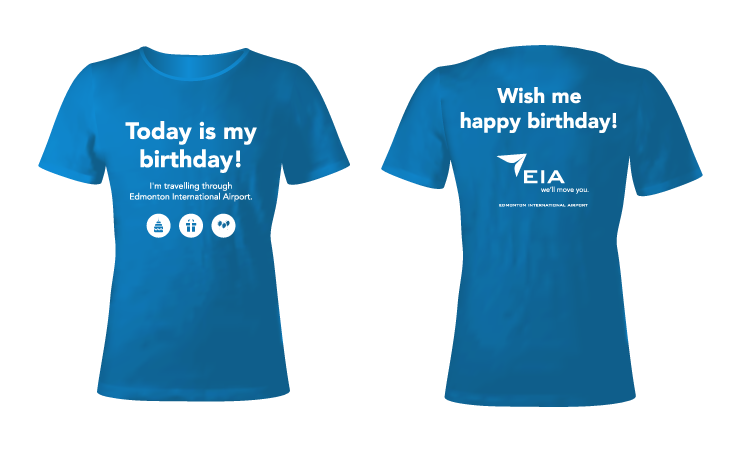 If you are travelling through Edmonton International Airport on your birthday – stop by the info booth and pick up your ‘Happy birthday t-shirt’ and a card from EIA. We want you to have an amazing day even though you are travelling. *While quantities last. EIA reserves the right to cancel the birthday program at any time for any reason. Please note the info booth is only open from 8:00 am - 12am Monday-Friday; 9:00 am - 8 pm on Saturday; and 9:00 am - 12 am Sunday and holidays.